I’m Hosting another outdoor photography workshop in Hyderabad on Fashion & pre wedding couple shoot, this workshop is designed to teach Composition Rules & theory, Posing, Best use of available resources, how to best use of natural light with reflectors. this event is bridge between workshop and real professional shoot, a very good chance to test your mettle and improve your skills and have lots of fun – working with professional models and networking with other creatives in a professional, high-energy environment. 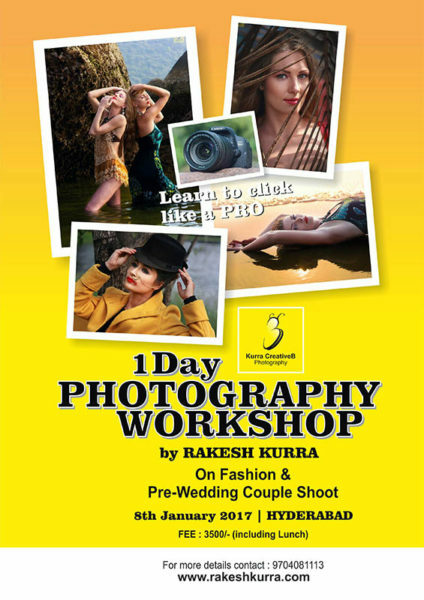 This workshop is open to all people who owns SLR camera, this workshop is perfect for freshers as well as Professionals who want to build fresh images in their portfolio in fashion & pre wedding shoot. To get more information about this workshop Please browse my previous workshops gallerias.